Anguilla is a small island at the northern end of the eastern Caribbean island chain. One would assume its idyllic and slightly remote location would suggest a peaceful and contented existence, but not so. It was populated by Arawak indians from South America about 2,000 years B.C., colonised by British in 1650 from nearby St. Kitts, but retaken by Caribs only about six years later. For the next 150 years, it was disputed by the British and French. In 1824, the British placed it under administration from St. Kitts. which was resented by the population of Anguilla. This dissatisfaction simmered until 1967 when Anguilla staged a revolt which, although quashed, resulted in a political solution being reached whereby Anguilla became self governing British dependent territory in 1976. 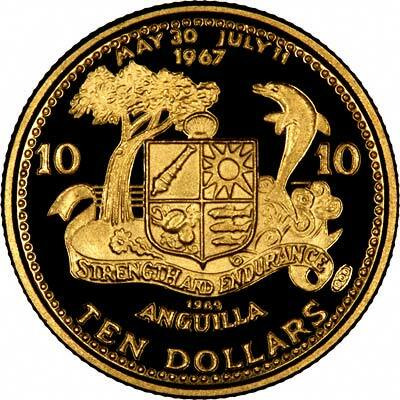 Anguilla first issued gold coins in 1969. These are all proof commemorative issues. 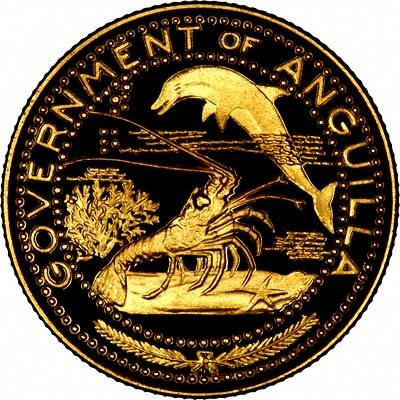 For silver and base metal coins of Anguilla, please look at our original Chard Coins website. We make an active market in almost all world coins, gold or otherwise, including Anguillan gold coins. If you have any of these coins to sell, please contact us, or post them to us for appraisal and offer.